I’ve given up trying to predict California’s wildflower bloom. 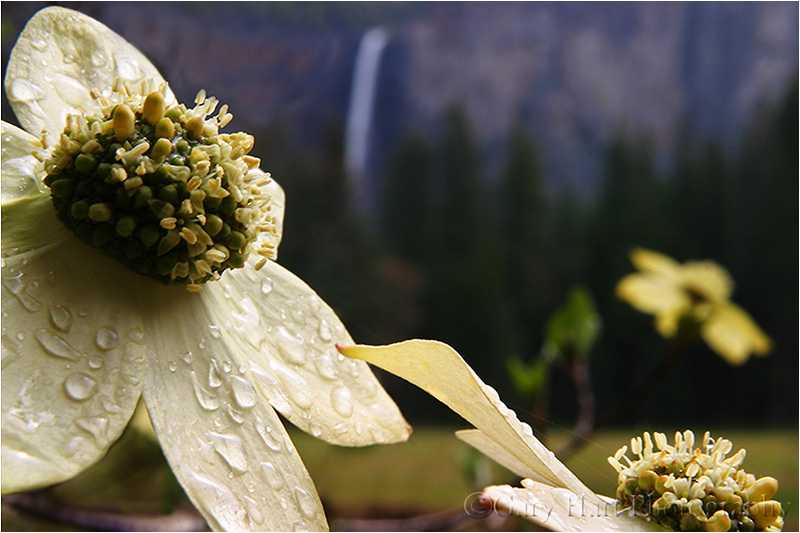 There are a lot of theories about the conditions that cause a great wildflower bloom: wet winter, early rain, late rain, warm spring, wet spring, and so on. For each condition correlation you can cite, I can cite an exception. So now I just cross my fingers and wait to see what spring delivers. Well, it turns out this is a great year for wildflowers in California. Death Valley is winding down its “super bloom,” the best since 2005, my Facebook feed is suddenly saturated with California wildflower images, and it seems like every day I’m hearing about another don’t-miss poppy location. While Death Valley’s bloom was dominated by yellow, daisy-like desert gold, with a few other varieties and colors sprinkled in, for most of California it’s the poppy that takes center stage each spring. The highlight of Sunday my drive from Phoenix to Sacramento (I know, not a lot of competition for highlights on this route) was top-to-bottom orange hillsides flanking the usually maligned Grapevine (if you’ve lived in California, you know what the Grapevine is; if you haven’t, just ask a Californian. But be prepared to endure a lengthy “that time my car broke down” story). There are many ways to photograph poppies, ranging from wide panoramas that highlight poppies’ propensity to dominate vast expanses of the landscape, to tight macro views that emphasize their elegant curves and translucent gold and orange. Likewise, there are depth decisions to be made with each poppy composition, from complete front-to-back sharpness to a single, minuscule point of sharpness. 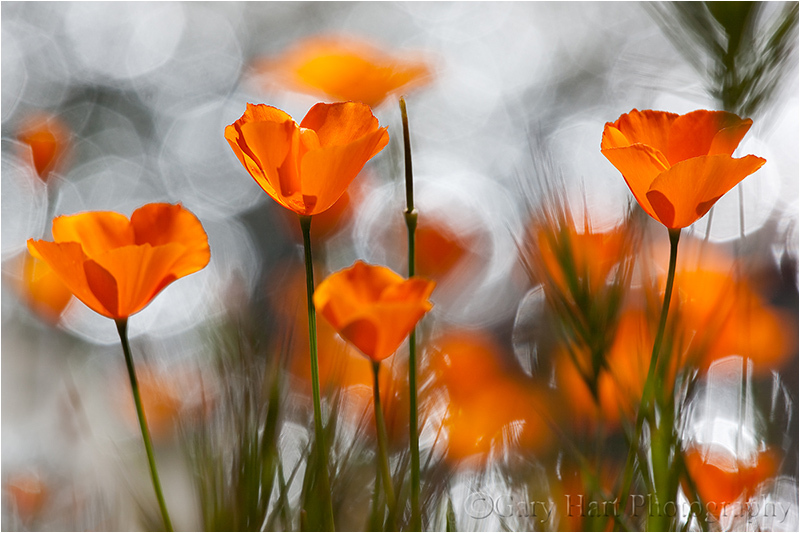 While I’ll employ whatever approach I think best serves the scene, my poppy images tend toward close focus and limited depth of field captures that use a paper-thin sharpness range to blur all but the most essential aspect(s) of my scene. With this approach, I can highlight my subject, blur away distractions, and create a complementary background of color and shape. 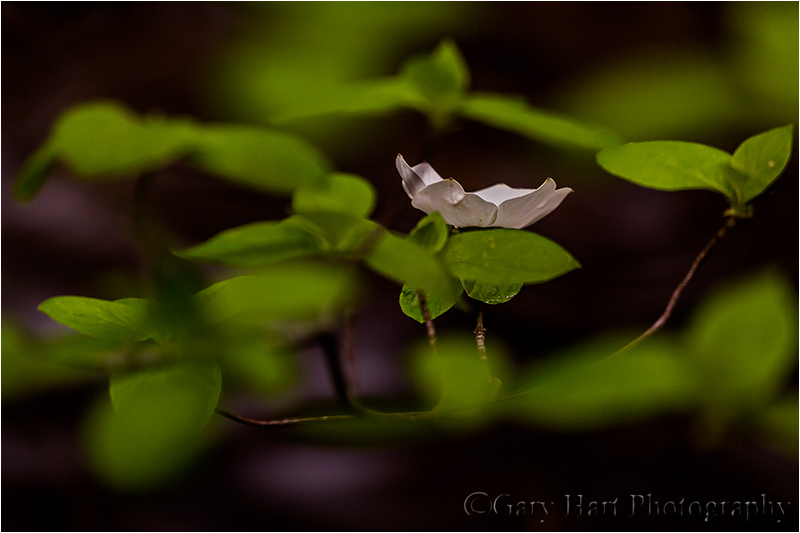 I start by identifying a flower or flowers that I can isolate from the surroundings. Finding the right background is as essential finding the right subject—without my subject and background working in unison, the image will almost certainly fail. What’s the right background? Other flowers, sparking water, deep shade (that I can turn dark green or black)—use your imagination, and experiment. Given my desire for minimal depth of field, my lens choice is usually a function of the background’s distance from my subject—there’s an inverse correlation between focal length and depth of field, so the farther away the background, generally the longer the focal length I choose. Since a narrow depth of field is my goal, I usually start wide open (my lens’s widest aperture). To focus closer than the lens permits and further reduce the depth of field, I sometimes add one or more extention tubes. With my subject, background, lens, and f-stop determined, I set up my tripod as close to the subject as I can focus and get to work. Because of the amount of review and refine I do, a tripod is an essential part of my approach—I can’t imagine doing close focus photography without one. With each click I scrutinize the result for adjustments, large or small—when I’m ready for the next click, having the scene I just reviewed waiting there for me on my tripod allows me to apply my refinements without having to recreate the image as I would if I had been hand-holding. In the world of close focus photography, the scene looks completely different to the camera than it does to the eye, even more than most other types of photography. So I usually don’t identify my ultimate composition, focal length, and f-stop until I’ve worked the scene awhile. When I get the composition the way I want it, I usually run through a series of f-stops to give me a variety of subject sharpness and background blur effects to choose between when I review my images later on my large monitor. At the kind of magnification I normally use for these close focus images, even the slightest breeze can introduce motion blur that ruins an image. I’ve become so comfortable shooting at high ISO with my Sony a7RII that my default close-focus ISO for shade or overcast is now 800. If there’s a breeze, I’ll go all the way to ISO 6400—sometimes higher. Whatever your camera’s high ISO capability, it’s very helpful to familiarize yourself with your ISO comfort zone for your camera. Because your eyes see a close-focus scene so differently than the camera sees it, your close-focus photography will improve with experience. When you start, some of your best images may be accidents, blurred background effects that you didn’t anticipate. But soon you’ll come to learn what to look for, and how to achieve it. 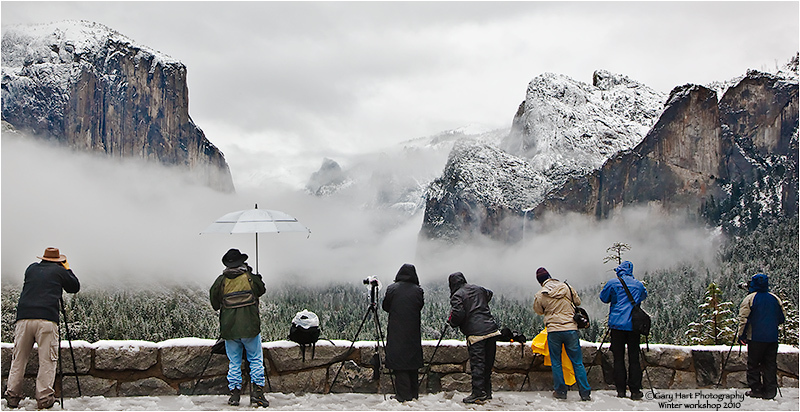 In this day of ubiquitous cameras, automatic exposure, and free information, a creative photographer’s surest path to unique images is achieved by managing a scene’s depth. Anyone with a camera can compose the left/right/up/down aspect of a scene. But the front/back plane, a scene’s depth, that we human’s take for granted, is missing from a two-dimensional image. Managing depth requires abstract vision and camera control beyond the skill of most casual photographers. We call an image’s out of focus area its “bokeh.” While it’s true that bokeh generally improves with the quality of the lens, as with most things in photography, more important than the lens is the photographer behind it. More than anything, achieving compelling bokeh starts with understanding how your camera sees the world, and how to translate that vision. The image’s focus point, its depth of field (a function of the f-stop, sensor size, focal length, and subject distance), and the characteristics of the blurred background (color, shapes, lines) are all under the photographer’s control. Compelling bokeh doesn’t require special or expensive equipment—chances are you have everything you need in your bag already. Most macro lenses are fast enough to limit DOF, have excellent optics (that provide pleasing bokeh), and allow for extremely close focus (which shrinks DOF). A telephoto lens near its longest focal length has a very shallow DOF when focused close. 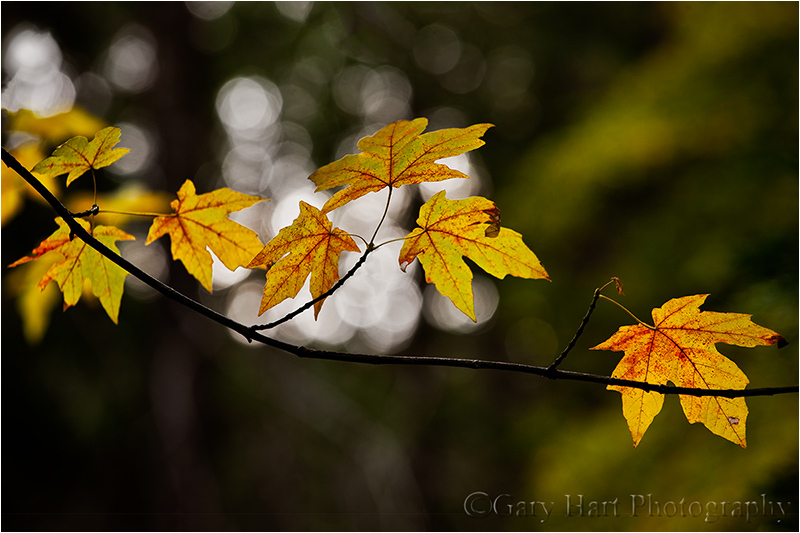 Another great way to limit your DOF without breaking the bank is with an extension tube (or tubes). Extension tubes are hollow (no optics) cylinders that attach between your camera and lens. The best ones communicate with the camera so you can still meter and autofocus. Not only are extension tubes relatively inexpensive, with them I can focus just about as close as I could have with a macro. They can also be stacked—the more extension, the closer you can focus (and the shallower your DOF). And with no optics, there’s nothing compromise the quality of my lens (unlike a teleconverter or diopter). But there’s no such thing as a free lunch in photography—the downside of extension tubes is that they reduce the amount of amount light reaching the sensor—the more extension, the less light. On the other hand, since I’m using them to reduce my DOF, I’m always shooting wide open. And the high ISO capability of today’s cameras more than makes up for the loss of light. Many of my selective focus images are accomplished without a macro or even a particularly fast lens. Instead, preferring the compositional flexibility of a zoom, I opt for my 70-200 f4 (especially) and 100-400 lenses. While my 100 macro is an amazingly sharp lens with beautiful bokeh, I often prefer the ability to isolate my subject, in a narrow focus range, without having to get right on top of it. On the other hand, if I have a subject I want to get incredibly close to, there’s no better way than my macro and an extension tube (or two, or three). When using creative soft focus, it’s important that your background be soft enough that it doesn’t simply look like a focus error. In other words, you usually want your background really soft. On the other hand, the amount of softness you choose creates a continuum that starts with an indistinguishable blur of color, includes unrecognizable but complementary shapes, and ends with easily recognizable objects. Where your background falls on this continuum is up to you. A macro lens and/or extension tube is the best way to get extremely close to your subject for the absolute shallowest DOF. But sometimes you don’t want to be that close. Perhaps you can’t get to your subject, or maybe you want just enough DOF to reveal a little (but still soft) background detail. In this case, a telephoto zoom may be your best bet. And even at the closest focus distances, the f-stop you choose will make a difference in the range of sharpness and the quality of your background blur. All of these choices are somewhat interchangeable and overlapping—you’ll often need to try a variety of focus-point/focal-length/f-stop combinations to achieve your desired effect. Experiment! Primary subjects are whatever moves you: a single flower, a group of flowers, colorful leaves, textured bark, a clinging water drop—the sky’s the limit. 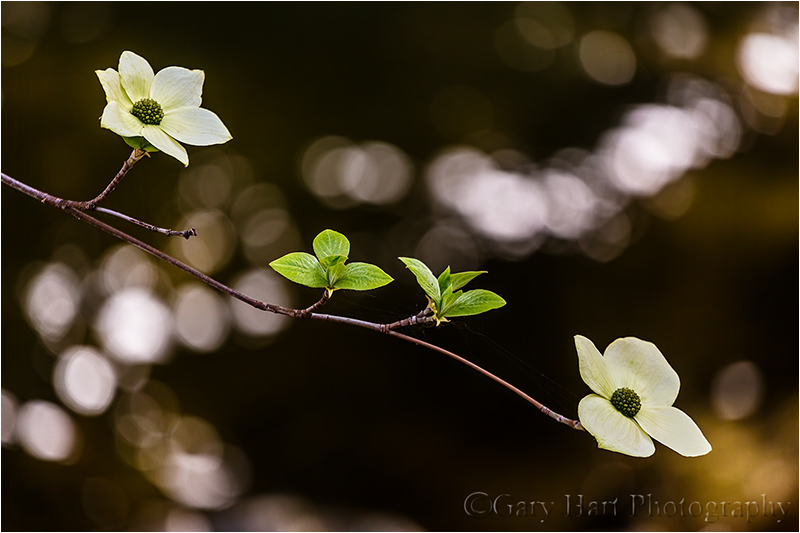 A backlit leaf or flower has a glow that appears to originate from within, creating the illusion it has its own source of illumination—even in shade or overcast, most of a scene’s light comes from the sky and your subject will indeed have a backlit side. And an extremely close focus on a water droplet will reveal a world that’s normally invisible to the unaided eye—both the world within the drop and a reflection of the surrounding world. My favorite backgrounds include parallel tree trunks, splashes of lit leaves and flowers in a mostly shaded forest, pinpoint jewels of daylight shining through the trees, flowers that blur to color and soft shapes, sunlight sparkling on water. 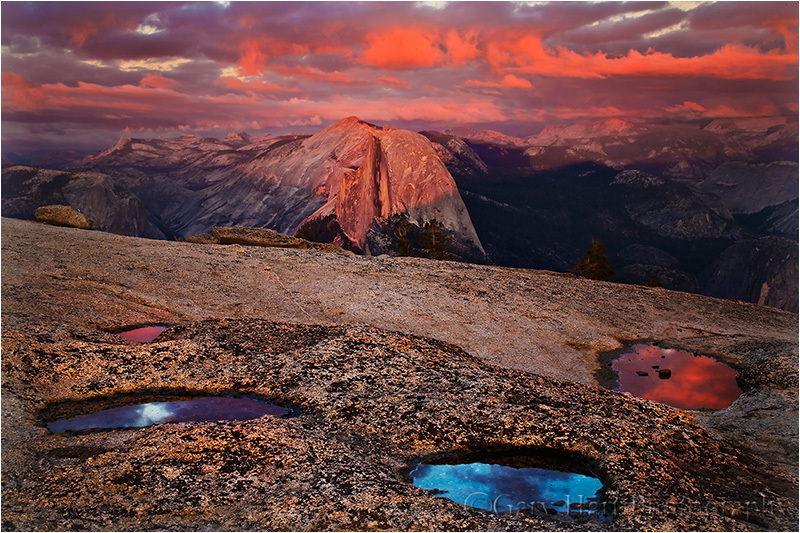 I also like including recognizable landscape features that reveal the location—nothing says Yosemite like a waterfall or Half Dome; nothing says the ocean like crashing surf. The final piece of the composition puzzle is your focus point. This creative decision can make or break an image because the point of maximum sharpness is where your viewer’s eyes will land. In one case you might want to emphasize a leaf’s serrated edge; or maybe its the leaf’s intricate vein pattern you want to feature. Or maybe you’ll need to decide between the pollen clinging to a poppy’s stamen, or the sensual curve of the poppy’s petals. When I’m not sure, I take multiple frames with different focus points. Exposing selective focus scenes is primarily a matter of spot-metering on the brightest element, almost always your primary subject, and dialing in an exposure that ensures that it won’t be blown out. Often this approach turns shaded areas quite dark, making your primary subject stand out more if you can align the two. Sometimes I’ll underexpose my subject slightly to saturate its color and further darken the background. And let’s not overlook the importance of a good tripod. In general, the thinner the area of sharpness in an image, the more essential it is to nail the focus point. Even the unavoidable micro-millimeter shifts possible with hand-holding can make the difference between a brilliant success and an absolute failure. 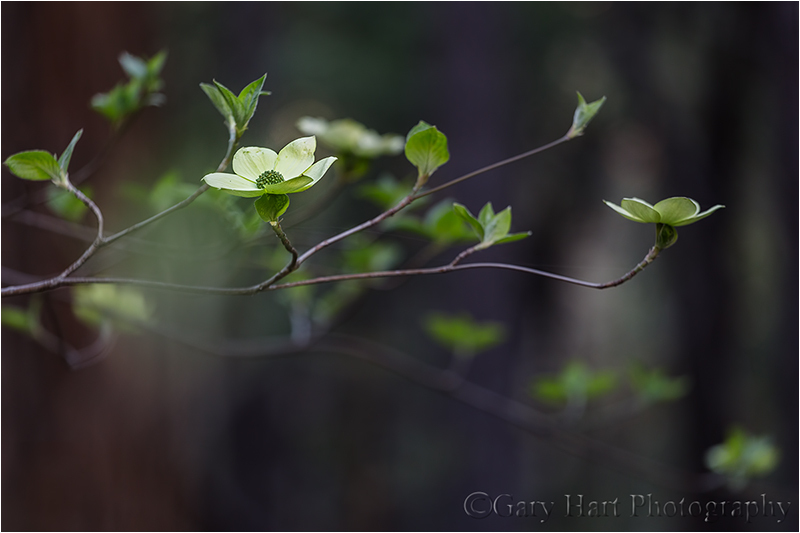 Here, rather than background bokeh, I framed my dogwood flower with leaves in front of my focus point. A recent mishap forced me to replace my Canon 5D Mark III (a story for a different day). A quality backup and good equipment insurance made my accident no more than a minor inconvenience, but setting up my new camera this morning reminded me of a few camera settings I consider equal parts essential and obscure (or taken for granted). So essential that I set them once and they simply become part of my in-the-field workflow; so obscure that I have to hunt to find many of them in the menu system. What I share here is specific to Canon in general, and the 5DIII in particular, but much of it will apply to Nikon and other DSLR cameras as well. Some of my suggestions may seem obvious, but you may find some surprises too. Set Date/Time and keep it accurate: Okay, maybe this one isn’t too obscure, but I think the time and date are important to get and keep right, rather than something set once and forget. In fact, when Daylight Saving Time starts/ends, I (try to) make a point of going in and making the appropriate adjustment. The same applies to travel through time zones. Why is all this important? Because often I like to know what time the Rainbow starts on Bridalveil fall in April, or when the light leaves Delicate Arch in October—when my calendar and clock is right, all I need to do is return to a past image and check its capture date/time. I can also figure the altitude (angle above the horizon) of any location by checking the time of an image of the sun or moon rising/setting at that location on a given date, then refer to an app or website for the sun’s/moon’s altitude at that time. Enable Highlight Alert (“blinking highlights” that flash when blown): I can think of no reason to not turn Highlight Alert on, but remarkably, on many cameras it’s off by default. Blown highlights are death to an image, but sometimes we overlook them until it’s too late. And sometimes whatever’s blown is too small to even register on the histogram—not a big deal if it’s a patch of snow on a distant peak, but a huge deal if blown highlights are in the rising full moon that’s the focal point of your entire scene. Not sure your whether your Highlight Alert is turned on? Take an extremely overexposed image and replay it on your camera’s LCD (don’t forget to cycle through all possible views)—if you don’t see any flashing, Highlight Alert is off. Disable Release shutter without card (or whatever it’s called on your camera): This is another no-brainer that comes set backward on all the Canon cameras I’ve owned (your results may vary). All it took for me to learn this lesson was losing an entire shoot with a new camera because I forgot to put a card in (true story). Maybe you have a reason to click your shutter with no card, but for most of us those times are few and far between. Reduce LCD brightness (and turn off auto-brightness): We all like our LCDs to be super bright because it makes our images easier to see in full sunlight, and images just look better when they’re brighter. The problem with a max-bright LCD is, no matter how well we understand histograms and tell ourselves to check it with every shot, there’s a natural tendency to base exposure decisions on the way the image looks on the LCD. A bright LCD fools us into thinking a too-dark image is just right. Not only do I see workshop participants doing this (all the time), I catch myself making this unconscious mistake too. So, if you’re frequently frustrated by images that look much darker on your monitor than they did on your LCD (don’t increase your monitor brightness! ), it’s probably because your camera’s LCD is too bright. I actually believe that a too-bright LCD is the source of many “My prints are too dark” complaints—the LCD tells you an image is bright enough (because you didn’t check the histogram), but when you put it on the computer at home, it’s too dark. Rather than fixing the real problem by giving your images more light at capture (something the histogram would tell you, BTW), you simply make your monitor brighter. Of course the best solution is to always check and trust your histogram—if you train yourself to do this, your LCD can be whatever brightness you like. Turn image rotation on for the monitor, off for the camera LCD: I like to use my camera’s entire LCD to view my images (long side of the image, whether horizontal or vertical, matches the long side of the LCD), but Canon (and maybe Nikon and the rest) must think nobody ever turns their camera vertically, because my camera’s default behavior is to rotate a vertical image so its top aligns with the top of the camera (where view-finder is). While Canon’s default rotation is great for my always horizontal monitor, I can and do flip my camera quite easily. Turning off rotation for the camera’s LCD ensures that the long side of horizontal and vertical images always aligns with the LCD’s long side. Download the manual’s PDF and put in on your smartphone: Okay, not a camera menu option, but definitely one of the first things you should do when you get a new camera. For years I’ve loaded my camera’s manual onto my computer, but with my Dropbox app I can also access it on my iPhone. Because manuals are big, and often the times I most need it I’m in an area with poor or no wifi or cell service, I use the Dropbox Favorites selection to ensure that the manual is always with me. Save your custom settings: On the Canon cameras I’ve used there’s an option to save and restore all of your menu settings to/from a media card. Do it (you can use one of those old, small capacity cards rattling around in the bottom of your camera bag), then mark the card containing the settings and set the card aside. Not only will this make recovery easier the next time you drop your camera in a creek on Maui (for example), it’ll save lots of frustration when you get your camera back from a repair and find everything back to factory default. Set back-button autofocus (and remove autofocus from the shutter button): For stationary subjects, there’s little reason to connect focus and the shutter click (if your subjects are in motion, for example if you shoot sports or wildlife shooting, you can make a strong case for keeping the autofocus connected to the shutter button). By removing autofocus from my shutter button and moving it to a different button on the back of my camera, I can completely separate the act of focus from the act of clicking a frame. When I want to autofocus, I simply point my camera’s focus point at the place in the scene on which I want to focus, press my focus button, compose, and click. (Setting this up is less than intuitive on Canon bodies—each time I get a new camera I have to figure it out again.) Here’s a primer on back-button focus, including instructions for the 1D and 5D bodies. Turn on Mirror Lock-up (to reduce vibration induced by the mirror snapping out of the way when you click your shutter): I suspect that modern damping mechanisms make mirror lock-up much less essential than it once was, and mirror vibration really is a problem only in the 1/10 to 1 second shutter speed range. But since Canon makes it a pain to turn mirror lock-up on and off, and I’m always on a tripod (if you’re hand-holding mirror lock-up is a total pain), I see no reason not to just leave it on and get used to clicking my shutter button twice (once to lock-up the mirror, and again to trip the shutter). Of course when you’re in Live-View mode, the mirror is already locked up, so this setting doesn’t matter if you always use Live-View. Write to two cards simultaneously (if your camera is among the majority without two card slots, you can skip this one): I’m kind of obsessive about backups, so when I got my 1DSIII, rather than use the second media card slot to store more images, I opted to write each image to both cards. And when I learned that the 5DIII would come with two slots, I was pleased that I wouldn’t have to compromise my peace of mind to save $3500. Has this feature saved me? I don’t use cheap media cards, so I’ve never had a complete card failure (it does happen), but I have lost a few images on one card due to localized corruption. The solution? Just pop in the second card with duplicates of all the day’s captures. My capture workflow goes something like this: In camera, write each image to a 32 GB CF and a 32 GB SD card. At the end of the day (this assumes on the road), I upload the day’s images from my SD card to my laptop hard disk and a to a portable external drive. I don’t delete anything until I run out of space; since I’m not a high volume shooter (on my nine-day trip to Maui, I filled less than half of a 32 GB card), an entire trip’s images usually stay on both media cards in my camera. In the rare event that I do fill a card, I clear the SD and replace the CF with a fresh one. Turn on ISO expansion: By default my camera’s ISO range is 100-12800. ISO 100 is my camera’s “native” (best) ISO, but when I want to slow my shutter, I like the option of dropping to ISO 50 before using a smaller (less than optimal) aperture. Unlike the film days, when ISO 50 gave you less noise, a DSLR’s ISO 50 is emulated and therefore not quite as good as its native ISO. I find that I lose about 1/3 stop of dynamic range at ISO 50. Expanding my ISO above 12800 is of little general value to me, but there are times when I find an extremely high ISO invaluable. For example, when photographing in the near absolute darkness of a moonless night, the meter, Live-View LCD, and viewfinder are of little value. Even though maxing my ISO gives me unsellable images, I can take sample frames that are clear enough to aid my exposure, focus, and composition choices. Turn on the RGB Histogram: Since the RGB (the three-color) histogram gives you three times as much info as the standard (luminosity) histogram, it’s the histogram you should be looking at. Fortunately, if you know how to read a luminosity histogram, you can read an RGB histogram (trust me). A luminosity histogram tells you whether or not you’ve lost detail in your image; the RGB histogram also tells you whether you’ve lost a color channel. For example, a luminosity histogram will tell you everything’s fine even if you’ve blown (clipped) two of the three color channels, leaving you to wonder later why your lovely blue sky or yellow poppy looks washed out. Set up the Custom Menu: My 5DIII has a custom menu screen that will hold all of the most commonly used menu selections so you don’t have to go hunting for them. When I press my menu button, this is always the first menu that appears. On my custom menu I have Battery Status, Format Card, Sensor Clean, VF grid display, Date/Time/Zone (see my very first point), and LCD brightness (to override my default setting when I want to check an image in bright sunlight). Many other cameras offer something similar. Since setting up my Custom Menu, I find that I do/check things I should be doing/checking much more frequently than I did when they required a hunt through my camera’s menu maze. These are my settings, but I think they’ll benefit most landscape shooters. Do they make me a better photographer? Perhaps not, but they do reduce distractions that might make me a worse photographer. There are lots of other settings in your menus that might surprise you and benefit the way you shoot—the next time you have an hour or so, grab your camera and manual and go through the menus. 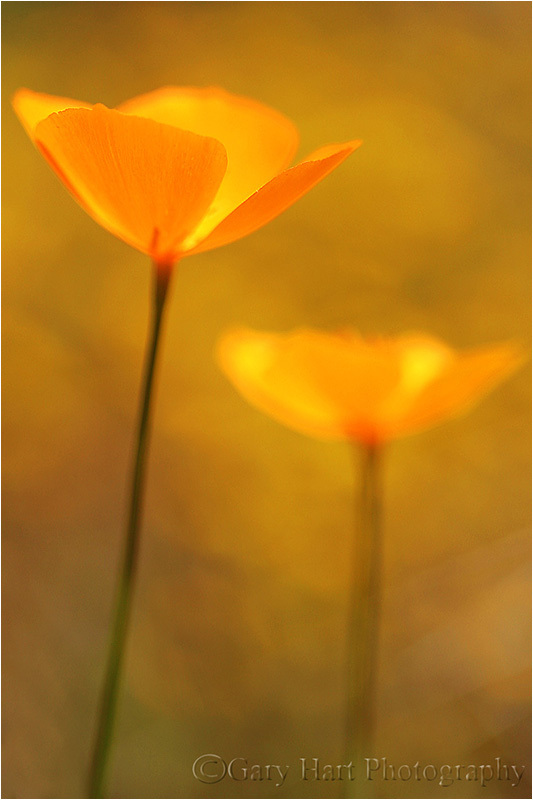 Over the years I’ve accumulated a number of go-to poppy spots scattered about the Sierra foothills. This location in the Merced River Canyon west of Yosemite, where a small creek drains into the river, I don’t get to as often as I’d like. But a couple of years ago I happened to hit it right at the peak of the poppy bloom and took full advantage of the opportunity. Bright sunlight and a breeze made exposure and composition tricky, but I soon became comfortable with my surroundings and started concentrating on tight compositions using my 70-200 with extension tubes. As I generally do with poppies, my goal was extremely narrow depth of field that highlights a prominent poppy (or two or three) and blurs background poppies and other wildflowers to smudges of color. But, noticing reflecting sunlight creating ephemeral reflections on the creek’s rippling surface, I wondered how my camera would capture sparkling water. Dropping to poppy level, I used a trio of poppies on about the same focal plane as my foreground and experimented with different f-stops to change the size of each glistening facet. The larger my aperture, the larger and less defined the sparkle. I loved the effect on my LCD, but it wasn’t until I processed my images at home that I decided on this f8 frame that more or less split the size/definition continuum in the middle.